Meadow Creek Ranch Bed and Breakfast Inn is one of the most beautiful Yosemite bed and breakfast inns in the Yosemite area. The historic Meadow Creek Ranch Bed and Breakfast Inn is centrally located between two entrances to Yosemite National Park. Meadow Creek Ranch was established in 1858 as an overnight stage coach stop for travelers to the gold rush town of Mariposa and Yosemite Valley, California. Meadow Creek Ranch BnB Inn was also a lumber mill, and working ranch. 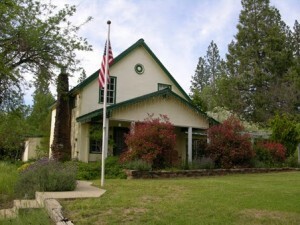 This historic Yosemite area property is now the peaceful and beautiful Meadow Creek Ranch Bed and Breakfast Inn. Jessie Fremont, wife of the famous General John C. Fremont, stopped here in 1859, proclaiming Meadow Creek Ranch “a haven of rest.” Should you choose to stay with us as well, we think you will agree. Half Dome in Yosemite National Park viewed from Glacier Point. The historic Meadow Creek Ranch Inn near Yosemite National Park. Our guests enjoy exploring Yosemite, driving next to the Merced River to the western Arch Rock Entrance one day, then the south entrance at the Mariposa Grove Giant Redwoods the next. We are 11.5 miles from Mariposa, in Mariposa County, the home of Yosemite National Park, and 15 miles from Oakhurst, California on scenic Highway 49. Meadow Creek Ranch Bed and Breakfast Inn is easy to find at the corner of Triangle Road and Highway 49. If you are looking for a quiet and peaceful retreat in the Yosemite area, we would consider it an honor to have you choose Meadow Creek Ranch Bed and Breakfast Inn as your Yosemite area BnB.